With a full-time course, part-time job, studying, socialising and extracurricular clubs and teams, it's no wonder you're often exhausted from running from one activity to the next. It's also no wonder that the more tired you get, the longer it takes you to complete tasks that you would otherwise fly through. If you think you're in over your head and need some help managing your time, use these tips and techniques to get you safely through the term – and beyond! Booking too many activities in one day. Not leaving enough time for travel between activities. Forgetting to schedule study and research time. Failing to allow some free time each day for relaxing and recharging. Set long term goals for the term, write them down and keep them where you can see them. This will help you remember what is important when faced with tough time decisions. Make mini deadlines for each of your assignments. Be sure to give yourself “final” deadlines that do not conflict. Set daily goals that you would like to achieve and set up a To Do list the night before. 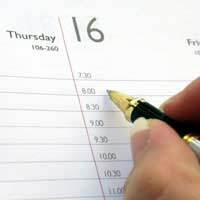 Leave enough room in your daily, weekly and monthly schedules to absorb unexpected tasks and activities without it wreaking havoc on your plans. Be realistic. If we worked 24 hours a day we could all get a lot more done, but this just isn’t going to happen. If anything, under schedule so that you don’t feel like a disappointment later. For as long as a typical class period. As three large chunks: “morning,” “afternoon,” and “evening”. Cleaning the bath while the oven pre-heats. Filing your nails while talking on the phone. Updating your To Do list before the start of a lecture. Reviewing lecture notes while waiting at the post office. Throwing in some laundry while you study, and hanging it to dry during your break. Reading assignments while on the bus. Listening to a book on tape while you drive. No one will realistically transform their time management skills over night, but even taking one new step each day will lead to a more organised, less hectic schedule in the near future. Don’t be afraid to invest significant time in overhauling your organisation and time management skills, even if you have to carve out a little bit each day. Go ahead and take the plunge – your sanity might just depend on it!